A controversial groundwater pumping plan that opponents argue could threaten the lower Rio Grande's already depleted supply is highlighting a conundrum in Texas water law. Texas rivers and springs are considered the property of the state, while water flowing below ground belongs to individual landowners. But many of the state's surface water resources, from Barton Springs to the Guadalupe, Colorado and Brazos rivers, are fed in large part by groundwater. So is the iconic and fought-over Rio Grande, whose lower portion flows out of Lake Amistad on the Texas-Mexico border and is the sole supplier of water to much of South Texas. A third of Lake Amistad's water comes from Val Verde County, and in many years, depending on rainfall and other hydraulic conditions, most of that water comes from below ground. Because groundwater and surface water are treated differently under Texas law, South Texas officials and environmental advocates fear there is little they can do to stop a groundwater pumping proposal by Beeville-based Val Verde Water Company that they say could endanger Amistad and the lower Rio Grande. Some Val Verde County residents have already raised concerns about a pumping project in their backyard, and environmental advocates fear its potential impact on the Devils River, which feeds Lake Amistad and also depends on groundwater for its flow. But Green said it’s the lower Rio Grande that could see the biggest effect. That’s because Littlejohn has proposed drilling wells near Lake Amistad, which is just under half full today. Pumping next to the lake could drain water from it, scientists say, or, at a minimum, partially deplete the aquifer that feeds it. 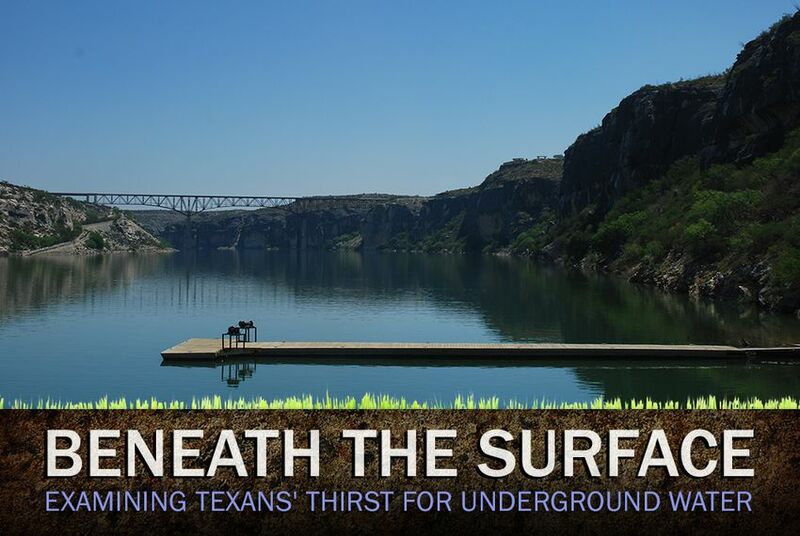 Littlejohn doesn’t dispute the possibility that his wells could draw water from Lake Amistad. But he said that under Texas law, Val Verde County residents have the right to sell the water beneath their land, especially since the drought has made agricultural income hard to come by. Opponents argue that any water depleted from Lake Amistad is water that won't head downstream to the already over-allocated lower Rio Grande. “We respect everybody’s right to be able to grow and to try and obtain additional water, but not at somebody else’s expense,” said Carlos Villareal, the city manager of Laredo, which relies entirely on the lower Rio Grande for its water. They also fear Littlejohn may have his sights on even more water than the 16 billion gallons he has indicated. His plan includes a pipeline that could carry as much as three times that amount. Laredo and Webb County officials, along with a number of irrigation districts in the lower Rio Grande, are forming a coalition to try to defeat Littlejohn's plan. But it’s not clear how much they can legally do to stop it. “The people in Val Verde County that have this water under their lands are the owners of this,” Littlejohn said. Creating a groundwater conservation district to protect such resources usually takes an act of the Legislature, which won't convene again until 2015. And even if a district is set up, the most regulators could do is limit pumping — not prohibit it altogether. State Rep. Eddie Lucio III, D-Harlingen, said a more viable option may be to produce more evidence that the pumping project would affect the state-owned Rio Grande. In that case, “there’s a strong argument to be made that it is still under state jurisdiction,” he said, and the Texas Commission on Environmental Quality could take action. Another option would be to invoke the federal law that protects endangered species in the Devils River basin. The Sierra Club effectively used that strategy more than 30 years ago to force the San Antonio region to limit its pumping, resulting in the creation of the Edwards Aquifer Authority. Mexico, too, could get involved, since that country shares the Amistad reservoir with Texas. Texas officials have recognized the connection between the two resources in other instances. This week, the U.S. Supreme Court allowed Texas to proceed with a lawsuit alleging that New Mexico had siphoned off some of the state's water supply, though New Mexico still has the opportunity to ask that it be dismissed. New Mexico’s alleged crime? Too much groundwater pumping, which Texas says has reduced the flow of the Rio Grande.